A king of scoring full backs he amassed a remarkable 61 goals for Liverpool without the aid of penalties, believed to be an all-time record. Even before England's 1966 World Cup winner Martin Peters was winning plaudits for his blind-side runs and being acclaimed as "ahead of his time" Lawler was master of the art. His stealth at gliding forward from a defensive position into a scoring situation was a potent weapon for the Liverpool side of the 1960's which deploying Lawler at right back partnered by Gerry Byrne on the left, marched to Championship and FA Cup glory. Quiet and self-effacing off the field - qualities which earned him the nickname 'Silent Knight' - Lawler oozed class and composure on it. He was also a highly capable performer at centre half, a role in which he made his senior debut in March 1963. 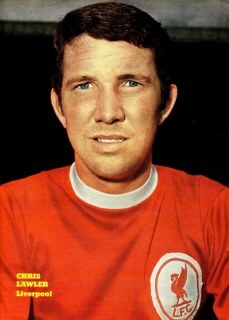 Liverpool-born Lawler, who made 241 consecutive League appearances between October 1965 and April 1971, won England recognition at schoolboy, youth, under 23 and full international level. He left Anfield for Portsmouth in 1975. He was Liverpool reserve team coach for years. The Kop called him "The Silent Knight". The statistics of matches and goals at the top is included in the table by the conducted player of a reserve in a seasons 1973-74 & 1974-75, 1975-76 not completely. 1971 v Malta, Wales, Scotland, Switzerland (4).